If you haven’t read the first 3 books, run away! I received this book as part of the blog tour for Around the World ARC tours and I couldn’t wait to get started. Destined picks up right where Illusions left off. The gang finally discovered who Yuki is and are now holding her captive. So much happens in this book, from bloody fighting to emotional roller coasters. All of the main characters are present and are in for a battle of their lives. Aprilynne brings in certain aspects of a known legend and makes it her own. I really enjoyed this aspect of the story, and love how it was written. Tamani and Laurel’s relationship continues to grow, as her relationship with David and Chelsea. This book is fast paced and takes place in a matter of a day. Full of action, sword fighting, and unbreakable friendships, Aprilynne concludes the series with a bang. There are a few aspects of the story that I wished turned out differently, but in the end, some things are necessary. I was sad to see this series go. Can’t wait to read what else Aprilynne has in store for us! 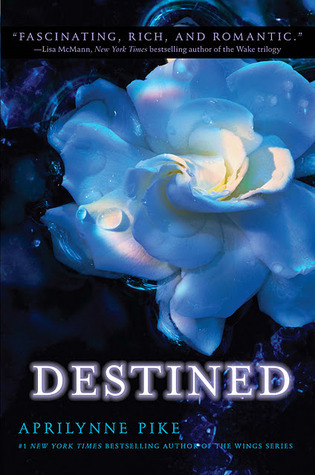 Destined comes out May 1st! ← In My Mailbox #36: The One with the Special Surprise! Oh! I read this too and I loved it! This was the best among all the 4 books in the series if you ask me. And while most may not be happy with the ending, I loved the way Aprilynne Pike ended the series..it made me tearful.